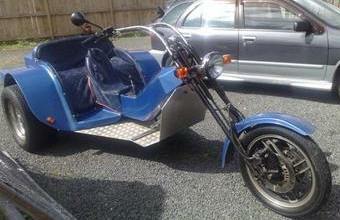 Motorcycle Trike Conversion - Information and links for the do it yourselfer. Larry, how's it going? Can you get me more information about doing a motorcycle trike conversion? There are an awful lot of sites dedicated to three wheeled motorcycles or trikes. Most want to sell you the entire pre-fab conversion kit or just cool LED lights, custom looking fenders, etc. There is not much out there in the way of help for the do-it-yourselfer. When you do find a site, most describe adding the front of a motorcycle to a rear engine car. Like this VW Trikes page. From what you said when I saw you in DA's I think you want to remove the rear tire and axle from your Virago and add a car axle & tires. Your problem lies in the drive shaft rotation. The shaft drive on your bike turns in the opposite direction of the drive shaft in a car. This means you will have to flip the drive shaft housing (aka pumpkin). How is this accomplished? Trial and error. Here are the few resources I have found for you. D & G Trikes - Located in Tremont, IL (USA) they claim to have 50+ years of experience in the bike biz. In addition to building trikes from Hannigan Kits they also sell parts & accessories. Frankenstein Trikes - they sell rear ends to convert chain and belt drive bikes to trikes. Click the Tike Rear Ends button on the left. They have photos of each model and a video of one being assembled. Even if you still want to do the modifications yourself, these photos may help. British views on Trike building - with photos and diagrams. Honda CX500C conversion to a trike using a Datsun 210 - useful diagrams! Pretty meager pickings, I know. I assume that most people who have done a motorcycle trike conversion have have done so just for themselves and don't want to be sued if you duplicate their work and have an accident. Or they do custom modifications as a business and are not into giving away their info. Since you know you want to use a car for the back of your trike, here are a few photos of converted motorcycle trikes I found. It's interesting, but probably not what you are going for. This bike sold on ebay in April, 2009. It was described as a 1989 Virago XV1100 with a Chevy Camaro rear end and a fiberglass fender. These seem to be becoming more popular. The first photo is from Texas. 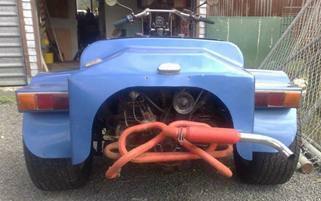 Here is a 1300cc trike from New Zealand. 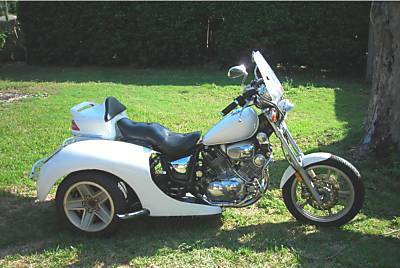 Motorcycle Trikes For Sale - tons of photos and information. Virago Tech Forum - ask other Virago owners about their own custom motorcycle trike conversion. Check out the posts, maybe you can learn from others experiences. Hannigan Motorsports - The Three Wheel Motorcycle Specialists! If you decide to go with a pre-fab kit keep reading. 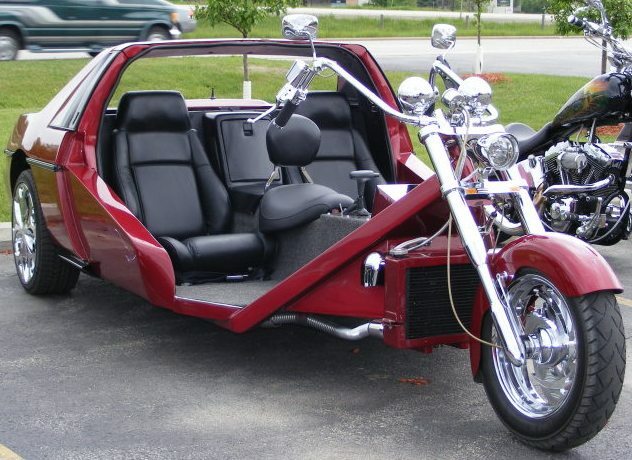 There are quite a few companies that make conversion kits to turn your motorcycle into a trike. The prices and components vary. You can get everything including fenders, suspension, seat with backrest and lights or just a bare bones kit that in composed of a bracket, axle, sprocket (or final drive) and brake system. Here are a few links to companies that provide kits to do the conversion at home without the hassle of fabricating parts yourself. And last, for the mechanically challenged, MTCVoyager.com - this is a bolt on accessory that gives you the look of a trike without modification of your bike. 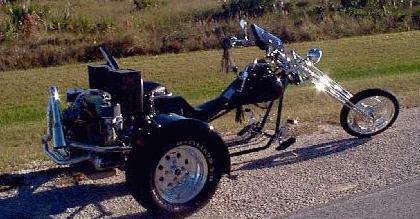 Have you created your own Custom Motorcycle Trike Conversion? We would love it if you could share it with the visitors of Weeks Motorcycle.